Our short USD/CAD idea looks like it panned out well…almost. The pair did find resistance and fell lower, but unfortunately it found sellers below our entry price around 1.0240 before falling lower. Close Open Orders. No trade. Hello! We have a potential short play setting up on USD/CAD as the pair approaches previously tested resistance on today’s US Dollar rally. The Greenback rallied on a broad base today as traders priced in the general belief that the Fed rate cuts are near its end. This belief will probably continue to push USD higher against CAD up to the resistance area, which may hold until tomorrow’s US Non-Farm Payroll numbers. Unemployment claims have been high throughout April ending with today’s number at 380K claims for the week. This does not look good for NFP or for price action in the Greenback tomorrow. So, if we do see the market take the pair up near 1.0300, then I look to short and target the bottom of the range highlighted on the chart and possibly lower. 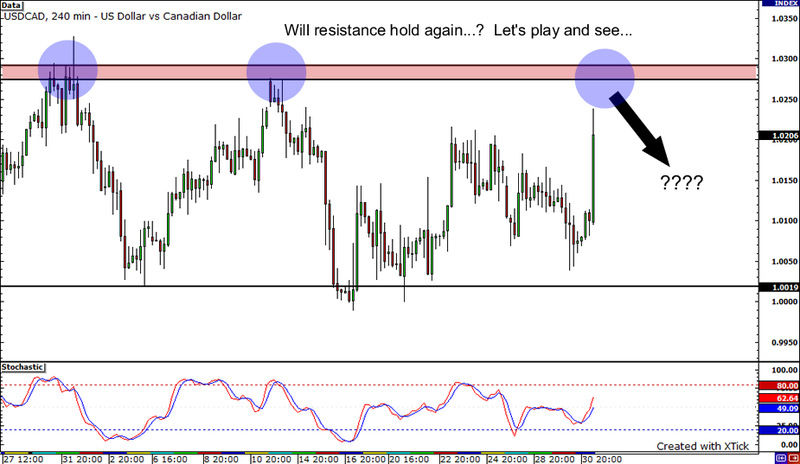 I look to risk around 100 pips for a rough 3:1 risk to reward ratio. Good luck and stay tuned for updates, especially around tomorrow’s US Jobs data!